Hybrid cloud computing offers the best of both worlds. It combines the benefits of public cloud – agility and low costs – with the control, performance and security of a private cloud. This has huge potential to help businesses, but many still struggle to understand what a true hybrid cloud really is. To help, I’ve debunked the top five myths surrounding hybrid clouds. 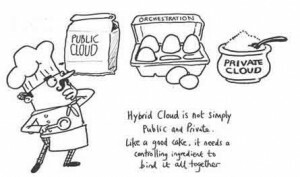 Simply having both cloud infrastructures in place does not give you a true hybrid cloud. In fact, you could end up having the benefits of neither and the risks of both. When moving secure data to the public cloud it’s easy to go against data protection laws and the migration of apps from public to private clouds can lead to unexpected costs. Having a true hybrid cloud means controlling your workloads, storage and network resources in a way that limits risk and increases productivity. Utilising fully engineered solutions reduces complexity and enables choice – choice in the technology upon which the hybrid cloud is standardised – VMware, Microsoft, OpenStack – and choice in the public clouds companies’ on premise private clouds can interoperate with. An engineered solution speeds three critical elements of development: 1) end-to-end integration and testing to ensure all components work together, 2) use of converged infrastructure to dramatically simplify the delivery and deployment, and 3) pre-defined blueprints for services with workflows to automate provisioning through a self-service portal. Once you have taken into consideration governance, risk and compliance concerns, a hybrid cloud model actually has a lower total cost of ownership. It’s easy to violate local or global data protection regulation when placing data or workloads in the public cloud. Laws and local requirements vary across markets, and some are so complex that businesses avoid the public cloud all together. Therefore you may want to choose a private cloud for more sensitive workloads. In Germany for example the rules are particularly strict when it comes to how data is stored and processed. The key lies in your public and private cloud working in harmony, delivering the advantages of each to the workloads that need them the most. 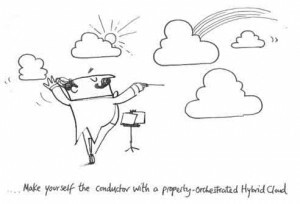 While some aggressive cloud players can make it hard to extract or migrate your data, a properly orchestrated hybrid cloud environment allows you to retain control. A well-run hybrid cloud can rapidly deliver public and private resources, providing control and visibility to IT departments and the on-demand self-service that developers and application users expect. Organisations are often hindered by complex IT infrastructure inter-dependencies, as well as an incomplete inventory of their IT assets and their relationships to business applications. With just a spreadsheet and no disciplined methodology, it can be nearly impossible to accurately assess application suitability, much less placement in the correct cloud architecture. Experts who use automated platforms for data collection and analysis can provide a comprehensive view of the application portfolio and determine whether you should migrate, consolidate, modernize, or sunset applications. I hope this has helped clear up some aspects of hybrid cloud that are frequently misunderstood. The opportunity is just too great to ignore. So are you ready to make the most of what hybrid cloud has to offer?